Milan fashion week: Fashion reacts to economic crisis? Last Wednesday March 3rd, Milan fashion week drew to a close after seven exciting days spent presenting the new women’s collections on the catwalks for the next autumn-winter season 2009/2010. The most famous Italian fashion houses took part in this fashion event, showing their creations and conveying the image of a refined, self-reliant woman, who loves luxury, with a strong personality and intriguing sensuality. Milan fashion week was eagerly anticipated by fashion journalists, media and critics because they were all curious to know what Italian designers would be able to achieve. How would they represent the idea of Italian fashion and style in such a difficult period as this, with the fierce economic recession affecting the entire world? Looking at this fashion week, it is not difficult to realize that the economic crisis really exists and that it is negatively impacting the fashion world too, which in everybody’s imagination is the symbol of perfect beauty, the expression of a woman’s dream. Italian fashion houses, just like most Italians, are suffering because of this recession: people are less likely to buy luxury clothes or accessories anymore and the fashion sector is at a standstill which provokes an incredible loss of money, very few profits and the inevitable decision to make some budget cuts in the creation of a luxury fashion collection. This year, more than 10 famous brands decided not to take part in Milan fashion week because of the impossibility of preparing an appropriate collection which would enhance the brand and their popularity. The Florentine designer Roberto Cavalli just presented his own collection, and had to give up presenting the JUST CAVALLI line, because the company ITTIERRE with whom he collaborates in the creation of this line, is facing some economic problems and was no longer able to guarantee him a collection that would live up to the brand image and its popularity around the world. Other designers that took part in this Italian event were criticized for putting together poor and unexciting collections. However, although some designers tried to confront the economic crisis by proposing very sober styles, classic essential lines without any complementary accessories such as luxury bags, necklaces or hats, to make their creations more affordable in price and accessible to a larger group of customers, there have been many other famous fashion houses that, at this difficult time of recession, focused all their energies on creating a very high quality product, a gorgeous luxury item of perfect Italian manufacture,distinguished for its elegance and refinement, for its perfect stitching for the selection of prestigious fabrics and leathers used for its manufacture. Sophisticated silks, gorgeous velvets with damask decoration, wool and cashmere, have made these creations genuine masterpieces of glamour and sensual elegance. Particular attention was also paid by this second group of designers to accessories such as shoes, gloves and luxury handbags because, in their opinion, these are very important elements to complete the woman’s look, affirming her dynamism and sensuality. Shoes and boots should have vertiginous heels and wedges to enhance the woman’s legs, which are encased in matt black nylons for the day and very sensual black micromesh nylons at night. Luxury handbags for daywear are wide and comfortable, almost all made of genuine leather, though some designers preferred using gorgeous exotic leathers such as crocodile both for some dresses from their autumn-winter collection and for the bags to match. Evening bags can be summed up in a single word: clutches. They are the in handbag to wear to a glamorous party or a special evening event, according to what was shown by most Italian fashion houses at Milan fashion week. 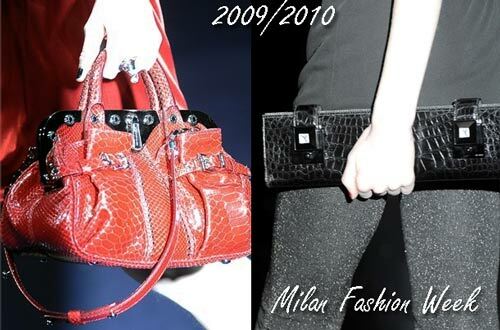 The clutch, as an eternally sophisticated style of bag, will dominate the fashionable evening scene next autumn-winter 2009/2010, as the uncontested essential of an elegant woman’s style. Made of genuine leather or of lustrous fabric, soft or structured, clutches are everywhere, always clasped in the hand, matching the dress in color and style. Where possible, clutches are also worn by the woman across the body, thanks to the refined long gold or silver chain strap. Gloves are really gorgeous, made of leather or fabric, black or colored to match the dress, short or elbow length, shiny or matt. Analyzing the new proposals presented at Milan Fashion week in more detail, we can confidently say that, as regards style, there is a return to the past. We’re revisiting the 70’s and 80’s with high waisted trousers or skirts, leather coats and stretch leather trousers, maxi shirts and cropped jackets defining the waist line worn with wide trousers. We can find a touch of the 80’s also in some of the fashionable fabrics characterizing these autumn-winter women’s collections: there is a return to shimmering silks and lamè fabrics for the evening look, perfect for enhancing a woman’s elegance and natural luminosity, especially if she wears a sober long dress. Fabrics are covered by rhinestones and sequins, which shine in the light and bring to mind the glamorous sparkling dresses worn by movie stars or famous international singers of the 80’s at the Oscars or other important celebrations. Thirty years on, fashion repeats itself but doesn’t lose any of its glamorous beauty. A woman dressed in an elegant long dress, enriched by decorative rhinestones and pearls is always gorgeous, just as much today as yesterday, because elegance is timeless. The most fashionable colors, recurring in almost all the collections presented, are classic tones such as white, light beige, grey and black (this color is especially recommended for a chic evening look combined with gold or silver necklaces or colored accessories), alongside brighter colors such as fuchsia, purple, emerald green, turquoise, yellow, orange, acid green and light pink. Gold and silver are a recurrent theme, used as a contrast to black or for accessories such as bags, shoes and jewelry. Taking a look at these colors, we can’t help making a brief observation: most of these colors are typical fresh summer colors, vivid shades which usually brighten up our summer evenings but here, as we can see, they have been used by Italian fashion houses to create the trendy look of next winter!!!! Have they perhaps used these positive, sunshine shades to exorcize their fear of difficult, dark times brought on by the financial crisis? It could be possible!!!! Do you want to read in more detail about the women’s fashion collections presented by Italian designers for next autumn-winter season 2009-2010? Don’t miss our next article, to be posted on the Gleni blog in a few days!!!! Hi, I do think this is a great website. I stumbledupon it 😉 I’m going to return once again since i have book-marked it.